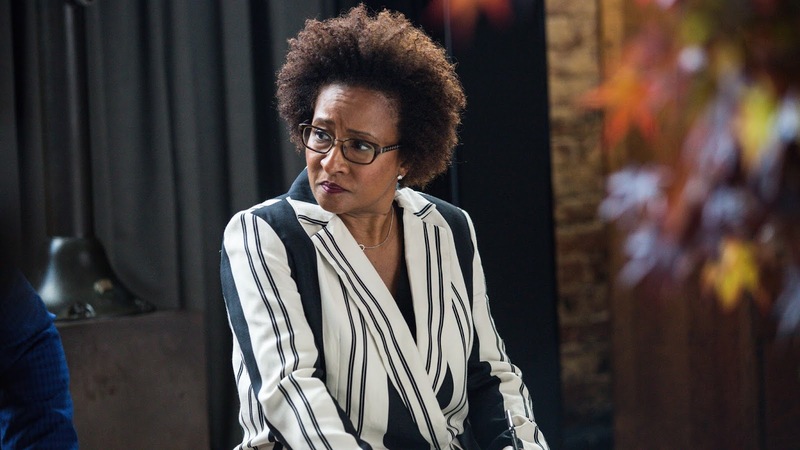 Yendani’s manager, Shuli, played by Wanda Sykes, brings Carey, Pat, and Brooke to Justin Theroux’s church (currently Chase and Pat are staying at his apartment while he’s out of town) - because apparently he has a church in his place. There we find out that 100% of the problem is Brooke. Though not before Carey confesses several of the suspect things he’s done in his personal life, such as attempting to sniff Christopher Meloni’s underwear. But finding out what a colossal mess she is sets Brooke up for some growth. There is an opening to be Chase’s assistant and Pat offers it to her if she wants it. After visiting Lance and failing to get the ego boost she’s looking for, Brooke decides taking the assistant job might not be such a bad gig after all. Plus it means she can stay at Justin’s apartment with her mom and brother. Though her bed is a round cushion in Theroux’s shoe closet. Apparently he only has one bedroom, but three saunas. Elsewhere, Carey is starring in a play! He’s even got the lead role! Although it’s literally called While John is Sleeping and he plays… you guessed it, John. Which means he’s asleep the whole time. But his family still comes out to support him which is sweet - even if they do miss the opening where he has a monologue because the theater looks like a hovel and is impossible to find. Carey is more focused on other things anyways, like his vexing roommate Max who masturbates openly in front of him while having a conversation. Carey still can’t figure out if he’s gay or not but he asks him to get a drink and Max says yes! Except it’s with all his douchey friends. But then he kisses Carey in the bathroom. Eventually they end up back at the apartment - Max invites his friends, so Carey throws himself down the stairs to gain his pity. I mean who hasn’t thrown themselves down a flight of stairs so their crush decides to take care of them for the night. Things kind of work out for Carey too since taking care of him somehow makes Max horny and he lets Carey give him a hand-job. It’s start! He seems happy with it anyways. - Brooke: I was at my friends who just had a baby, ugh, why do people do that? - When Pat and Chase need a place to stay they crash at Justin Theroux’s apartment because he’s out of town and Streeter manages him… for music. - Brooke: You haven’t even hung out outside the apartment. Carey: Yes we have. We arrive home at the same moment all the time. - Justin Theroux has a motorcycle toilet apparently. I’d believe it. - Shuli: She doesn’t have a last name, well she did, but it’s Irish so we dropped it. - Pat confesses to doing something terrible! Her friend on Facebook was always posting photos of ducks and one time she commented “enough with the ducks” and unfriended her. - Brooke: People on Twitter always tell me I’m a classic white feminist. Shuli: That’s not a good thing. - When Brooke tells Lance she’s staying at Justin Theroux’s apartment his first thought is Lego Ninjago. - Brooke: Someone DVR Real Housewives of Atlanta for me. - Pat: They broke up. Yendani got an offer to start dating Millie Bobby Brown tomorrow. A new episode of The Other Two titled "Chase Gets the Gays" airs February 14th on Comedy Central.